Cult | What is Ann Watching? I remember watching Donnie Darko (2001) on home video, shortly after it was available for rent and being enthralled, creeped out and confused. At the time it didn’t make complete sense, but strangely, it didn’t matter as much as I would have expected it to. I just thought it was a creepy, poignant metaphor for madness. When the Director’s cut was released on DVD in 2004, I bought it, tucked it away and waited for the right time. Over a decade has passed since then. Why was last night the right time? Maybe because Jake Gyllenhaal was on my radar after my daughters and I saw his guest appearance on a recent episode of Inside Amy Schumer . We were looking for a creepy movie to watch together so I figured it was time to watch Donnie Darko again. Wow, this film holds up very well. It is set in 1988 and follows a troubled high school student into what appears to be a descent into madness. Or is it? We witnessed time travel and alternate universes on a backdrop of suburban life. To say more would risk spoiling the experience. I was hoping for more clarity with the director’s version this time around. By the end, I was still left wondering, “WTF?” If you like those kinds of, what I like to call, “WTF Movies” (Inception, Memento, Shutter Island, to name a few) and don’t mind googling an explanation or 2 afterward, then this is film is for you. The film was written and directed by Richard Kelly and had an awesome cast. Young Jake Gyllenhaal in the titular role was superb as his character flipped between simply awkward to seriously disturbed. He was supported by Drew Barrymore (she also executive produced), Patrick Swayze, Mary McDonnell, Maggie Gyllenhaal (in a meta role as his sister), Noah Wylie and Jenna Malone. There are even a few brief, before they were famous, appearances by Seth Rogen and Ashley Tisdale. The 80’s New Wave soundtrack (INXS, Echo and the Bunnymen, Tears for Fears, The Church, Joy Division) was well chosen. The family dynamic portrayed in the film is a sweet realistic contrast to the disturbing events that abound. There is minimal gore. The special effects are few and not distracting. 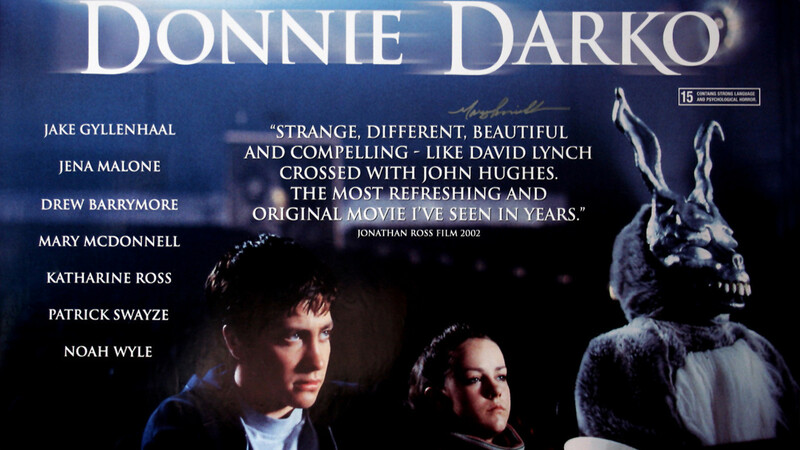 If you like a film that keeps you guessing, Donnie Darko is definitely worth a watch. If you can understand it by the end, then you will have impressed me. I find solace in the knowledge that I was not alone; the late great Roger Ebert shared my confusion. My daughters and I had fun googling for explanations and talking about watching it again in the near future with a better understanding. Maybe I will check out the director’s commentary; that is something I haven’t done with a film in a while. Below are some links we found helpful, but I caution you to use them only if required, as they contain spoilers.